A man lies on a skin mat resting his head on a neck-rest, whilst two children sit around him, possibly plucking out the man's pubic hair. The film number suggests an Eastern Jikany homestead in 1935, possibly at Mancom where Evans-Pritchard spent some 4 weeks. In the background stands a youth, possibly Evans-Pritchard's servant Tiop. Note on print reverse ms pencil - "83 3" & print front border ms ink - "NUER XIII/6"
Morton, Chris. 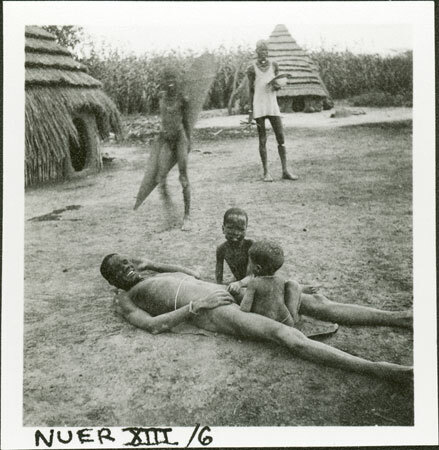 "Nuer man on neck-rest" Southern Sudan Project (in development). 03 Jan. 2006. Pitt Rivers Museum. <http://southernsudan.prm.ox.ac.uk/details/1998.355.603.2/>.